How to make wine at home….? Its a question for all during Christmas season. Here is an easy wine that can make easily for this special season. 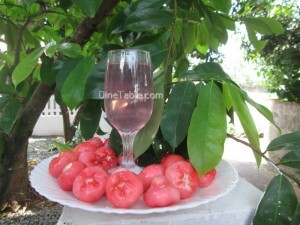 Rose Apple wine is one of the special Christmas wine. A Christmas is incomplete without a wine. Rose Apple is A.K.A Chambakka or champakka in malayalam language. This wine is very tasty and by serving this wine can surprise the guests and family members for the Christmas party. Apart from the normal wine, this is a special wine. It is very easy to make with less ingredients. Clean and wash the rose jambakka with water. Use a food processor or a juicer to collect as much of the juice as possible from the fruit. Use a dry cotton or muslin cloth to bundle up the fibrous paste and squeeze out all the juice. Pour the juice into a 10 litre stainless steel vessel. Pour the water, beetroot piece and sugar. Boil for 5 minutes then stir occasionally until all the sugar is dissolved. Once it boils nicely, switch off the heat and cover with a lid. Let it cool for sometime. Add yeast and stir well with a wooden spoon. Pour this mixture to a ceramic jar and cover it with a cloth. For the first ten days out of 21 days, the jar should be open on alternative days and stir the mixture with a wooden spatula. After 21 days strain the wine using a thin cotton towel. At the end of that period, all the sediments would have settled down at the base of the jar. Pour the wine carefully into another clean, dry vessel without disturbing the sediments.